Yechiel Michel ha-Levi Epstein (Hebrew: יחיאל מיכל הלוי אפשטיין‎) (24 January 1829 – 24 February 1908), often called "the Aruch haShulchan" (after his main work, Aruch HaShulchan), was a Rabbi and posek (authority in Jewish law) in Lithuania. His surname is often preceded by ha-Levi, as he descended from a family of Levites. Epstein studied Torah locally, and was encouraged to do so by the town's rabbi and his parents (the concept of an out-of-town yeshiva was only slowly gaining ascendancy). After his marriage he received semicha (rabbinic ordination) and accepted his first rabbinical position. Epstein became the rabbi of Novozybkov (east of Gomel, now Bryansk region), a town with a large number of Hasidic Jews, mainly adherents of Chabad Lubavitch. 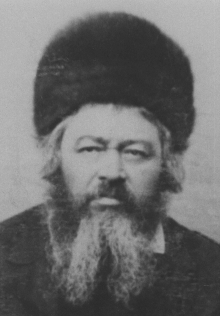 Nine years after accepting his position in Novozybkov, in 1863, Epstein was appointed as the rabbi of Navahrudak, where he would serve for 34 years, until his death. Here, he was recognised as a posek (decisor of Jewish law), and he was to compose most of his writings in Navahrudak. Epstein was involved in many charitable endeavors. He was particularly close to Rabbi Shmuel Salant, the chief rabbi of Jerusalem, and wrote extensively on the obligation of all Jews to support the Rabbi Meir Baal Haneis charity that Rabbi Salant founded in Israel in 1860. Epstein died on 22 Adar II 5668 (1908), and is buried in Navahrudak. His son, Rabbi Baruch Epstein, was a bookkeeper by profession but produced a number of scholarly and popular works, most notably the Torah Temimah. Leil Shimurim - a commentary on the Haggada. Chaim Shapiro. The Aruch HaShulchan. In: "The Torah Personality", ed. Rabbi Nisson Wolpin. Brooklyn, New York: Mesorah publications, 1988. ISBN 0-89906-860-X. This page was last edited on 1 October 2018, at 11:20 (UTC).